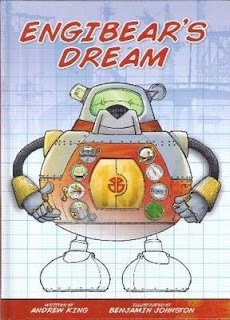 Engibear, like many boys, is a classic dreamer who loves to invent and then build things. Told in verse that scans well, his epic begins with his decision to invent a ‘Bearbot’ to help him with future creations and, in his meticulously organised workshop, he sets to work preparing plans for ‘Bearbot Type One’. Once built, however, it appears that Type One is ‘not without faults’ and, ‘KABOOM!’, Engibear must immediately begin work on ‘Bearbot Type Two’. With disastrous yet funny failures along the way, the conclusion eventually sees Engibear’s tenacity win out. Bearbot Type Ten is a huge success. Hurray! And, just as any success deserves, the last four pages revisit the exciting journey to reflect on issues that occurred from prototype to final model via each type’s blueprints being provided, highlighted with numerous technical but easily understood notes and specifications. Besides excellent characterisation of Engibear and each Bearbot, illustrations of the disasters also give readers much to laugh over. My favourite is that of a crinkled Type Seven lying ‘flat as a plate’ after inadvertently landing in the path of a bulldozer. My favourite non-disaster illustration is inside Engibear’s home where walls hold portraits of ‘Alexander Graham Bear’, ‘Thomas Beardison’, ‘Bear Brunel’, ‘Bearstav Eiffel’ etc. I thoroughly recommended this book for 3-10 year olds.